In 1894, Charlie Hunter, who succeeded Old Tom Morris as the professional at Prestwick, laid out the original 9-hole course at Wigtownshire County Golf Club. Hunter also designed the inaugural layouts at Machrihanish and Royal Troon so the fairways here were fashioned by a man who was much in demand on the west coast of Scotland. Having purchased the property from the Scottish Department of Agriculture in the mid-1960s, the club subsequently acquired an adjoining 45-acre tract of land, allowing it to expand its operation, and so the number of holes was doubled to form an 18-hole course. Gordon Cunningham then designed the new layout which officially opened in May of 1987. 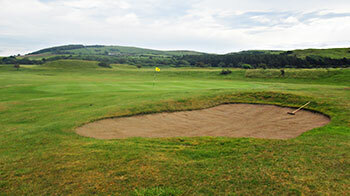 Located on the shores of Luce Bay, the free draining fairways at Wigtownshire County occupy a level, easily walked site, with many of the greens laid out as lie of the land putting surfaces. It’s a course that offers a basic, no frills links golf experience, enabling players to connect with an old-fashioned golf game that has sadly disappeared in the modern era. The course now stretches to 6,100 yards from the back tees, with only one par five in play at “Blackthorn,” the 538-yard 6th hole. The pick of the holes on the front nine is the right doglegged 4th, “St Helena,” requiring a semi blind approach to a sunken green that sits close to the shoreline. On the back nine, there’s an interesting run of holes between the 14th and 16th, where the 452-yard 15th (“Piltanton”) – the longest par four on the card – is sandwiched between a couple of short par fours. The last of the par threes follows this little sequence at the 17th, and the main defence of this hole is the sharp left to right slope of the green. Just off the A75 in Dumfries & Galloway you will find one of the most genuine and authentic links courses in Scotland; Wigtownshire County. It may not be one of the best courses in the country but there is an undeniable pleasure in playing at this rustic and old fashioned links. The main reason for this is the artfully located greens and the wonderful putting surfaces that have just the right about of borrows, merge seamlessly into the landscape and essentially bring this course to life. Despite being played over relatively flat terrain there is more movement in the land, albeit relatively subtle, than you may initially think and the unfussy and no-nonsense style golf here is refreshing. This is far from a dull affair and can truly be enjoyed by all standards of player. I came away from the course very impressed with the simplistic nature of the links and in that sense I can forgive what is very ordinary, in fact quite poor, bunkering and even the long walks to the next tee at holes two, three, four, six, 15 and 16!! The walk from the first green to the medal tee at the second is over 200 yards! As it was one of the few Scottish links courses that I hadn’t played, Wigtownshire County had been on my hit list for some time. It was evident from the opening holes that much of the course’s extra length has been gained by placing tee boxes for the next hole half way back alongside the hole just played, which was a wee bit disappointing. Greens were generally lie of the land and a touch on the bland side, though the putting surface at the 3rd is set rather nicely into a low sand ridge that runs through the course at that point. The following hole, the par four 4th, is easily the best on the card, with its fairway running along the coastline of Luce Bay. The course takes a few unexpected turns around the middle of the round as it moves more inland, resulting in cross over fairways at the 9th and 12th holes, and I really felt a more intuitive routing should have been achieved when the layout was increased to eighteen holes in the 1980s. The County course is an easy walk as it’s set out on a rather flat parcel of land and, unless the wind is up, you should be able to post a decent score here. The highlight of my visit was not the course actually, it was the homely little clubhouse where the welcome was second to none. Don’t expect a championship golf experience when you play here and you should be able to enjoy a fun game of golf at what is a very entertaining holiday golf venue.